While most of the nation begins to see cooler weather in September, southern California is often faced with hot, dry Santa Ana winds that make it a challenge to keep a garden green, hydrated and producing. Don't Overwater Despite Sagging Leaves: Droopy vegetable leaves are common during Santa Ana wind events. The leaves sag during the day but come back to life in the evening after winds typically calm down. Only water if the leaves do not bounce back after sundown. Stake Young Trees To Prevent Damage: Young trees are susceptible to wind damage if not staked properly. Add two stakes next to the trunk. Allow enough space between the stakes so the trunk can sway gently in the wind. Use ties that are flexible. Keep the stakes in place until the roots of the young tree have had enough time to develop deep into the soil (about two years). Remove Brush And Cut Tree Limbs: September and October make up the traditional fire season in southern California (although it seems it is now year round). Make sure brush is cleared from your property and any tree limbs touching the house are cut back. Keep landscaping near buildings well watered. 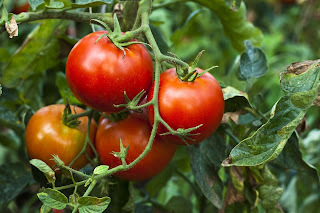 Plant Tomatoes For Fall Crop: Tomato plants can be planted in September while the ground is warm for a crop by late October. Spring-planted tomato plants may still be producing in September and through winter but the crop will dwindle. It is best to select tomato plants at your local nursery designed for cooler weather and start your tomato garden from scratch. Look for tomato varieties that have cold weather names such as Glacier and Siberia. Plant Annual Bulbs: Your local nursery will be getting shipments of bulbs in September. Add them around the garden now for spring flowers. Annual bulbs that can be left in the ground and will come back year after year include amaryllis, calla lily, Dutch iris, freesia and watsonia. Improve Garden Soil: It is time to rejuvenate garden soil after the summer growing season. Before adding new vegetables, loosen the soil and then add a six-inch layer of organic compost. Choose a compost that is specifically formulated for the soil type. Harvest Pumpkins Late In The Month: Harvest pumpkins if they have turned a bright orange, the rind is firm and the vine is brown. Bring indoors and store in a cool, dark location until it is time for pumpkin carving in October. Prune Hedges To Encourage Growth: Cut back long straggly stems from hedges. New growth will occur from within the hedge, which will protect the plant from possible winter frost.